"Shop Local! Shop Handmade! Shop Funky! The Funky Finds Holiday Shopping Experience is a FREE 2-day family AND pet-friendly handmade shopping event! Bring the family and be a part of the funky fun featuring over 120 Artists, Crafters, Designers, Authors & Food Makers selling their unique hand-crafted items! Attend Both Days...it's that FUNKY! The event will feature: Handmade Shopping Extravaganza, 150 Swag Bags & Charitable Raffle, Pet Adoptions by HSNT, Toys For Tots Drop Off, Photos with SANTA CLAUS, Funky Finds Balloons for All, and Event T-shirts for Charity & More! Find items in the following categories: Accessories, Art, Authors, Bath, Body & Candles, Ceramics & Pottery, Clothing, Food, Holiday & Seasonal, Home Goods & Decor, Jewelry, Kids & Parents, Stationery & Paper Goods, Pet Goods, Photography. Booths are 10 X 10 and cost $160.00. This fee includes event t-shirt, your linked logo on the Funky Finds Holiday Shopping Experience 2013 website for one year, listing on promotional items, 10% on booklet advertising, opportunity to have a listing on the back of Event & Vendor T-Shirts, opportunity to donate promotional items to 150 swag bags, and event promo postcards to distribute. Tables and chairs are available for rental. Applications are available here and are due by August 19th, 2014. "This show is all about vintage! Clothes, furniture, photographs, artwork, light fixtures, home décor, games, kitsch, nik naks, glass, repurposed and recycled vintage goods as well!" They are accepting Handmade & Vintage only. Booths/tent areas are 10 X 10 (outside) and cost $50. "This year's Lord's Acre will feature an antique car show, food trucks, artisan vendors, entertainment, country store, carnival games, petting zoo, pony rides, train rides, live auction, silent auction, children's area, bounce houses, dunking booth, jousting, gyroscope, obstacle course, cotton candy, snow cones, etc! We are especially looking for quality artisan vendors. This is a juried event and we welcome all applications for consideration." This is event is free to attend; however there is a small charge for events such as carnival games and bounce houses. Electricity available for indoor spaces only. All spaces include an 8ft. table and 2 chairs if needed. A Vendor Hospitality area will be open all day with drinks and snacks. Volunteers will be on hand to assist with loading/unloading as well as shorts breaks throughout the day. Applications are available here and are due by August 23, 2014. For more information, visit their website or contact their event coordinator, Lee-Ann, at edwards4750@sbcglobal.net, or Staci at stacijosmith@gmail.com. "We cordially invite you to attend 'A Fabulous Day' Bridal Affair." "Vendor fundraiser for Peggy Patison who has stage 4 brain cancer & The National Brain Tumor Society." 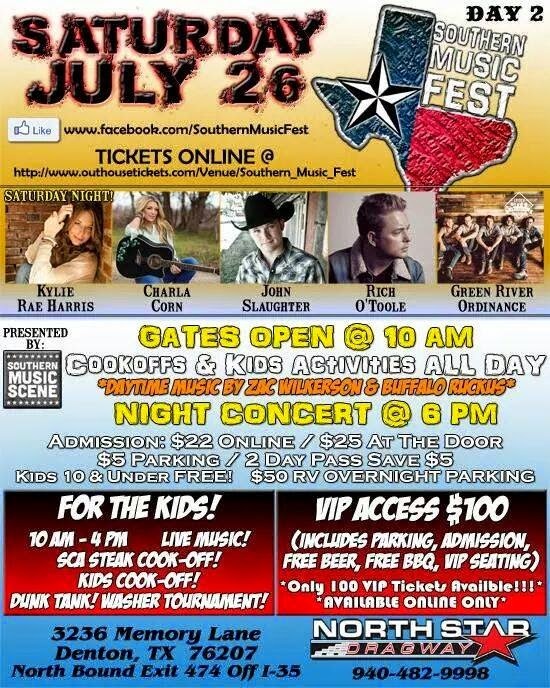 "Christmas in July is a Fundraiser for Foster's Foster Home in Stephenville TX. We will have live music by Atomic Apostle! Lots of Vendors, Food, 50/50 Raffle, Silent Auction, and Biker Games." To apply, please contact their event coordinator, bobbi@tritradingpost.com / 682-463-9252, by July 10th. Applications are available here and are due by July 19th, 2014. For more information, visit their website, facebook page, or contact their event coordinator at robin@hotironpromos.com. "Fairview Farmers Market replicates a European-Style market where customers can not only meet local farmers, artisanal food producers and craftsmen, but sample and purchase their products in a colorful, family-friendly venue." The market is held on a parking lot in between Macy's and JCPenney, facing Stacy Rd. Booths are 10 X 10 (two parking spaces) and cost $50. Payment is needed within 24 hours to secure your spot. Please bring a tent and something to weigh it down. Their is no make up date for this event in the event of bad weather. This is a non refundable booth fee. If sign up for the event and can't make it, you can find a replacement. For more information, contact their event coordinator at Josiefinel@yahoo.com. "The annual Bobcat Dazzler Holiday Bazaar and Craft Show features *free admission, *door prizes, *entertainment, *awesome vendors, *pictures with Santa, and much, much more!" Only one franchisee representative from each company will be allowed. We are happy to assist with loading and unloading of vendor supplies. Free continental breakfast from 7 - 9AM for vendors. Lots of advertising. Free coffee and lemonade for vendors. For more information, visit their website or contact their event coordinator at bdso5678@gmail.com / Mira 253-653-5738 / Julie 940-206-3670. "White Diamonds Expo is a business to business networking event. We bring together small business owners and professionals from the DFW area. This event features a business expo, VIP spotlight, open networking, door prizes, ice breakers, networking games, on the spot appointment setting, a giant business card exchange, and much more! First 100 Guests receive a FREE White Diamonds Expo bag filled with contact information of various business owners of the DFW area. Perfect for networking!" Booths are 8 X 10 and cost $60. Applications are available here and are due by August 13, 2014. For more information, visit their website, facebook page, or contact their event coordinator at success6m@gmail.com. 10 X 10 - $100 before 6/30, $125 after 6/30. 10 x 15 - $150 before 6/30, $150 after 6/30. Tables are $10. Electricity is $10. Lunch is additional fee. For more information, visit their website or contact their event coordinator at giftmarket@tcaeagles.org / Deborah at 817.732.5815. This fee includes includes electricity if needed. Applications are available here and are due by July 31, 2014. "A unique shopping experience with multiple vendors, coffee and snacks available for purchase. Musical Entertainment provided by performers at the Lighthouse Coffee Bar." For more information, contact their event coordinator at camicam0402@yahoo.com. Booths are 10 X 10 and cost $30 per day (Saturday or Sunday) or $55 for the whole weekend. Insurance is included. Electricity available on site. Applications are available here and are due by June 12th, 2014. For more information, visit their website or contact their event coordinator at info@fourseasonsmarkets.com. "Held the first Saturday in October, the festival is a fun-filled action packed day for the entire family in downtown Denison. Arts & crafts booths fill Main Street while food vendors delight shoppers with yummy festival food. Games & carnival rides entertain the kids from one end of Main Street to the other. The annual vintage car show and motorcycle show are separate yet equally shiny events that bring out the "buffs" with their rides. To keep the crowds entertained, multiple stages for musical entertainment and demonstrations fill the downtown area with day long activity. Come and enjoy!" Applications are available here and are due by August 30th, 2014. For more information, visit their website or contact their event coordinator at information@denisontexas.us / phone (903) 465-1551 / fax (903) 465-8443. This fee includes backdrop, chairs, all vendors are inside ballroom, carpet, air conditioning. For more information, visit their website or contact their event coordinator at vendorinfo@shoppingseasons.com / 2813040160. "Our version of a European Style Market opposed to a Farmers Market, Not only do we have produce vendors, food vendors but we also include artisan/craftsman vendors. Vendors that we are looking for are items that are made by the human hands, pottery, blown glass, jewelry, artists (paintings), as always look for the unique and unusual." "An evening of excitement and Eco-friendly fare while enjoying the “Sport of Kings.” The first 100 families will receive an exclusive Eco-friendly gift bags, including product samples and special offers from local and sustainable businesses. The evening includes a champagne divot stomp and the “Go Solar” Pavilion where attendees can enjoy samplings of local, organic and/or sustainable foods, alcohol, products, services and education. Match begins at 6:00 p.m. Any family may bring a picnic dinner/beverages and tailgate. Organic pizza slices will be available by Mellow Mushroom. The traditional champagne divot stomp provided by Proseco and an Organic libation tasting for all. Leashed dogs are welcome." Admission Fee: $10.00 per person; children 5 and under are free. "The 46th annual Gingerbread Trail celebrates architecture. Tour our special selection of five private homes. Get the inside scoop on restoration triumphs and local ghost lore. Visit lhistorically recognized buildings such as the Ellis County Museum, Sims Library, the Ellis County Courthouse and the Ellis County Art Museum. Explore the Arts & Crafts Fair on the century old Chautauqua campgrounds in Getzendaner Park. Under cool towering oak and pecan trees, enjoy colorful crafts and artwork from across the state. Artists present creative gift ideas and there are fun children’s activities, live music and plenty of refreshments to fuel your stay in Waxahachie."